Do you believe Sharia law is already in effect in your jurisdiction? Do you absolutely know for a fact that all the reports about the increase in numbers and dangers of domestic terrorists are just liberal plots and part of Jade Helm 3.0? Will the Lizard people who’ve infiltrated the FBI take down Trump? A lot of his websites have been shut down and he’s not the easiest guy to get a hold of but if you want to hear about how Jade Helm really went down and the false flag gun-grab at Sandy Hook went down and you’ve got the cash- Guandolo will be happy to do his performance for the rank and file or the membership. Generally speaking, whenever anyone hires this guy, reporters start calling up and asking why tax dollars are being spent to have a crazy person tell fairy tales to cops. Then whoever cut the check has to do the whole “well we didn’t know anything about the controversies and actually I’m not sure how this happened. I certainly didn’t invite him,’ routine. Are there some people in law enforcement that think this basket case is legit and on the level? Sure there are. But that’s not important. What is critically important is that law enforcement agencies and organizations understand that this guy’s a total fraud. If you really want to see how deep the bat-crap rabbit hole goes, check out his kid’s videos too. It’s a family business apparently. 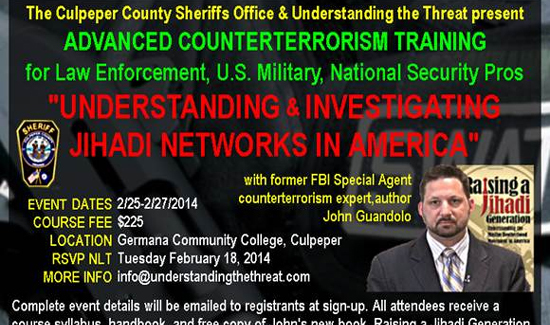 The global war on terror is the gift that keeps on giving for cranks like Guandolo. And let this be a lesson to all hustlers and B.S. artists worldwide. If you say enough ridiculous crap to people that want to hear it and are too lazy to check any of it out, you can actually make a really good living. Check out the crazy right here.